Full disclosure? I'm a total science communication nerd. I’m constantly distracted from research by science twitter (Sorry Ken!) and spend an inordinate amount of time thinking about how scientists can help uniform the public about all the great research going on thanks to their tax dollars. All this to say, I was immediately enamored with the ComSciCon organization. A monk started to prepare his simple lunch of rice, vegetables, and broth. After meditating for hours, he grew hungry and wanted a delicious meal. He looked inside a wooden vat of fermenting miso made from soy beans and wheat that he had prepared the winter before. All that was left were dredges that had seeped through the bottom. Curious, the monk decided to reach with a wooden spoon. As he raised the utensil to his mouth, the aroma wafted into his nostrils — toasty, caramel, and acidic. He brought the dark liquid to his tongue. According to legend, Shinichi Kakushin was a Japanese Zen Buddhist monk who has been credited with introducing soy sauce to Japan in 1254 AD. While both Chinese and Japanese monks had been exchanging recipes for soy sauce across the Sea of Japan since 772 AD, it wasn’t until Kakushin serendipitouslydiscovered a recipe for this particular shoyu soy sauce that the Japanese began their love affair with this universal condiment. “Science is chocolate. Science is not broccoli. We don’t need to trick people into liking it,” insists Liz Neeley, Executive Director of The Story Collider and keynote speaker for ComSciCon 2018. Over two jam-packed days in downtown Boston, graduate students from all walks of science converged for a workshop on communicating science to answer the question: how can we effectively use communication to maximize the impact of our science on our intended audience? Among them were two MIT Communication Lab Fellows: Josh Peters and I. Josh is a first-year Communication Lab Fellow in Biological Engineering who was introduced to the conference through fellow writers in the Massive Science Consortium, a community of STEM researchers supported by the science publication Massive. As a second-year Comm Fellow in Chemical Engineering, I applied to the conference in order to explore novel topics in science communication and bring them back to the MIT Comm Labs – while also sharing the Comm Lab model with others. Sheryl talks with Arianna Soldati (@AriannaSoldati on Twitter) about her research on volcanos, lava flows, and how they impact human safety. We also talk about being a grad student in a different country, being a "girly-girl" and also doing field work, and Arianna's passion for bringing accessible science education to rural people in her area. But Freeman, a public artist who teaches in the Visual and Media Arts Department, and School of Communication Dean Raul Reisbelieve that augmented reality (AR) and its close cousin, virtual reality (VR), have vast potential for telling the most pressing stories of science—climate change, public health, biotechnology, renewable energy, etc.—in a way that absorbs and engages the public. Learning how to communicate science to the public is vital for graduate students today; however, many programs do not offer formal training in communication. This gap has been filled by ComSciCon, an annual science communication training conference organized by and for graduate students interested in learning how to share their science knowledge with the wider world. ComSciCon is a national body which has given rise to a handful of regional meetings now joined by ComSciConATL. Organized by four graduate students (including our own Anzar Abbas), ComSciConATL brought together 50 graduate students from the Atlanta area and greater Southeast region in early March to learn science communication skills through interactive workshops, panels and networking with local experts, and collaboration between fellow attendees. During the second year of my PhD program in psychology, I found myself on the verge of quitting. I was overwhelmed by the pressures of graduate school, feeling bouts of imposter syndrome, and struggling to do research independently. I had considered other non-academic jobs but never had the gumption to discuss it with anyone, especially my adviser. Those were dark days. In February of that same year, I learned of an opportunity outside academia. A university email mentioned that applications were open for a national science communication conference called ComSciCon. The goal: to teach STEM grad students how to better communicate complex and controversial scientific topics to non-scientific audiences. 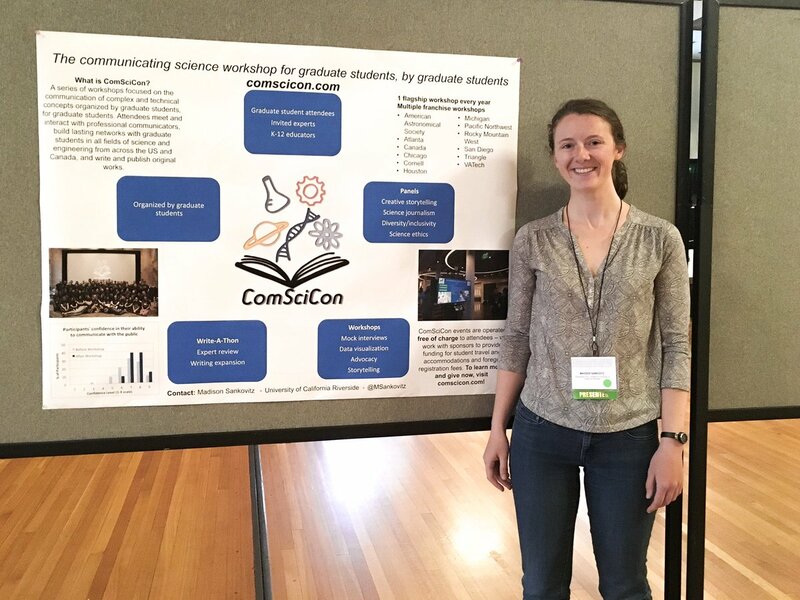 I had a great experience at Com Sci Con Houston, which is a conference on communicating science for graduate students and Post-Docs!